On arrival at Chiang Mai Airport, you will meet up with our guide and be transferred to your hotel. In the afternoon, your guide will pick you up at the hotel and will take you for a trishaw ride around the city passing along the city walls and Ratchadamnoen Road to Wat Phra Singh. Then you will visit the market where you will be able to experience a bit of the local lifestyle, following which you will drive up the mountain by "songtaew” to the Chang Khien Coffee Research Project where you can enjoy a cup of the local ‘arabica’ surrounded by a landscape of fabulous gardens of flowers. Continue to the white Hmong village of Chang Khien where the 800 inhabitants still wear their traditional hill tribe clothes and practice a culture that dates back 500 years and then to Wat Prathat Doi Suthep, the most sacred temple of Northern Thailand. Your guide will explain the story of the temple and will lead you around its impressive chedi to show you it’s beautiful murals. You will experience a very special atmosphere in the dusk of the late afternoon, when the tourist masses leave the temple. And, after your private blessing ceremony, the day will end with a spectacularly romantic evening with a view over Chiang Mai and its millions of glittering lights. This morning, drive north to a Lisu village where you can pick up your mountain bike and cycle for an hour or so along quiet, easy country roads through serene rural scenery to the Mae Taeng River where your elephant will be waiting for you. You will ride along narrow jungle paths for about an hour, with amazing views of mountains and the river below, to the rafting camp. Then you will have a picnic lunch in this beautiful spot before boarding a rubber raft after a brief training session, and paddle downstream through the sometimes calm, sometimes exciting waters of the river. Disembark for a visit to an exotic and very friendly Akha hill tribe village where you can enjoy tea with a local family. Cycle back to the Lisu village (about 45 mins) before returning to Chiang Mai in the late afternoon. Meals : Meals: Breakfast, Lunch. 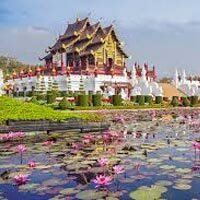 Depart Chiang Mai by minivan for Mae Kampong village in Mae On district, driving through the picturesque countryside of Chiang Mai. The village is located 1,300 metres above sea level and it is characterized by a cool climate all year long. En route, you will make a stop at a local market to select ingredients for today’s dinner, and then continue to Mae Kampong village where you will be welcomed by the villagers. Take a stroll through the community forest, passing tea and coffee fields, up to a refreshing waterfall where a picnic lunch will be served. In the afternoon, you will return to the village to relax with a traditional Thai massage and later join your host family to prepare dinner. A hot breakfast will be served by your hosts while enjoying the natural show of the morning mist being swept away from the valley by the cool mountain wind. You will be able to take a walk around the village to see the processing of fermented tea leaves and various products which are hand-made in the village. After a last cup of local coffee, head back towards Chiang Mai stopping on the way at Sankampaeng Hot Springs, a popular recreation area for locals. The water has a temperature in excess of 100 degrees centigrade, an incredible energy that has been attempted to harness! 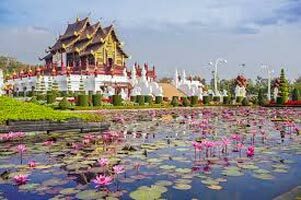 Transfer back to Chiang Mai Airport for your return flight and onward journey.